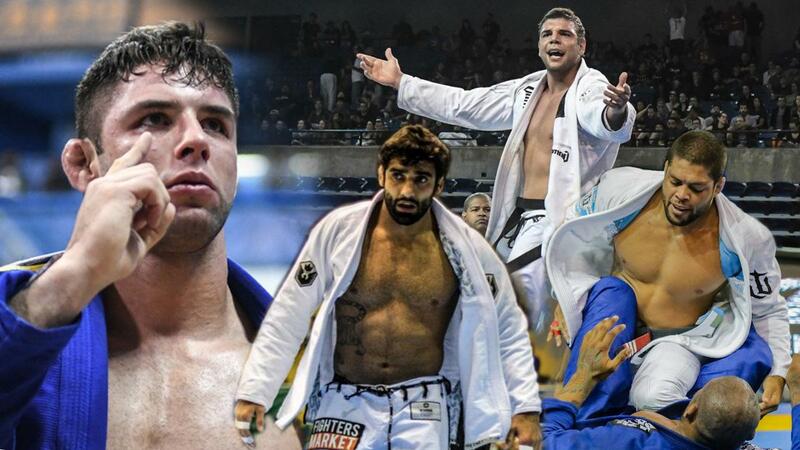 The biggest jiu-jitsu GP of the year - literally and figuratively - is almost upon us. The IBJJF Black Belt Pro League Heavyweight Grand Prix takes place in Las Vegas on Saturday, August 26. The Grand Prix will run as an eight-man single-elimination bracket over the course of the afternoon. The brackets are yet to come out, so right now we can't say for certain who's going to face whom. The cash prize for the winner is a huge $40,000, making this one of the biggest tournaments of the year in every sense! Here's a rundown of who is competing in the IBJJF Heavyweight Grand Prix. (Editor's note: Mahamed Aly has withdrawn due to injury and was been replaced on Aug 16 by Alexandre Ribeiro). The 10-time world champion (five times weight, five times absolute) crushed the World Championships this year, going unbeaten to win double gold just like he did in 2016. His explosive and dynamic game is unpredictable and -- as a result -- entertaining. Buchecha plays fast and loose and always looks for the finish. The former lightweight, middleweight, and medium heavyweight world champion has steadily moved up through the divisions in search of tougher challenges. "The man without fear" came within striking distance of a world championship medal this year, taking silver in both the heavyweight and absolute divisions. His breakneck pace and opportunistic style makes him a wily opponent for anybody. One of the most experienced men among the eight, Galvao combines technical prowess with tactical smarts. The Atos team co-founder knows exactly what he needs to do to win and how to achieve it under the big lights. One of the younger men in the pack, Rocha brings an undeniable energy with him whenever he comes to compete. A big, physically imposing athlete, Rocha loves to pile on the pressure and overwhelm his opponents. His youth and stamina are two of his major positive features. IBJJF Hall of Famer Xande Ribeiro returns for his second IBJJF Heavyweight Grand Prix. The renowned veteran black belt is one of the most decorated and respected competitors of the last 15 years, having captured seven world titles. GF Team's powerhouse ultra heavyweight Evangelista is solid, sturdy, and steadfast -- though rarely seen without a smile. It was he who injured Buchecha's knee in 2015, meaning he cannot be underestimated. His physicality is as much a challenge as his jiu-jitsu. One of the smaller men in the Grand Prix, Souza is one of the top athletes from the Alliance team and a regular podium finisher in major tournaments. He's also one of the most active, having been busy picking up double golds in IBJJF tournaments in Brazil right up to just a few weeks out from the GP. He's the final man to get the call-up and the one who was named Roger Gracie's replacement. Cruz is an old-school black belt who came up in the Gracie Barra team. He's a former world champ as well as an ADCC champ.